I am not immune to it’s draw, as I take the pic with my smart phone. Jeremy, the one who loves new technology the most actually has the most self control. Technology on our devices has been the easy answer. I am sick of it’s control on my kids and myself. I don’t want my default when I have a moment to pick up my phone or jump on my laptop. Or as soon as we get in the car, “Mom, can I see your phone?” or when Dad walks through the door after working all day, “Dad, can I see the ipad?” We slipped into using these a lot while waiting to move into our new house these last 5 weeks. It was an easy choice with most their toys packed up and not having a space of their own. But I am reversing the trend. I realize if I am going to set limits on my kids then I need to limit myself. Whatever I give them- I give myself. My role in ministry requires email use but still that can be limited to 30 minutes a day. I would prefer that be when they are asleep. I don’t want them to always see me on a device (texting, laptop, etc). So I want to email or write on my blog in the wee morning hours 🙂 or for a few minutes after they are tucked in. I considered using ipads during the day for some of our homeschool time but I know I can find other ways to teach them that requires my presence. I know myself, I give a certain time limit but then I get busy so 15 turns into an hour or more. I am weary of feeling like they are hooked. Check out this free website to bring adventure back to your family. Especially watch the video link by the founder, so good, it totally hit home for me. It made me realize THAT MY KIDS ARE TURNING TO DEVICES FOR ADVENTURE. And that is not ok with me. An occasional time, like maybe 15 minutes after dinner may work for our family. I don’t recommend it for all families but I think that is what I want for us. And still fun cartoons during the day like 30 minutes? 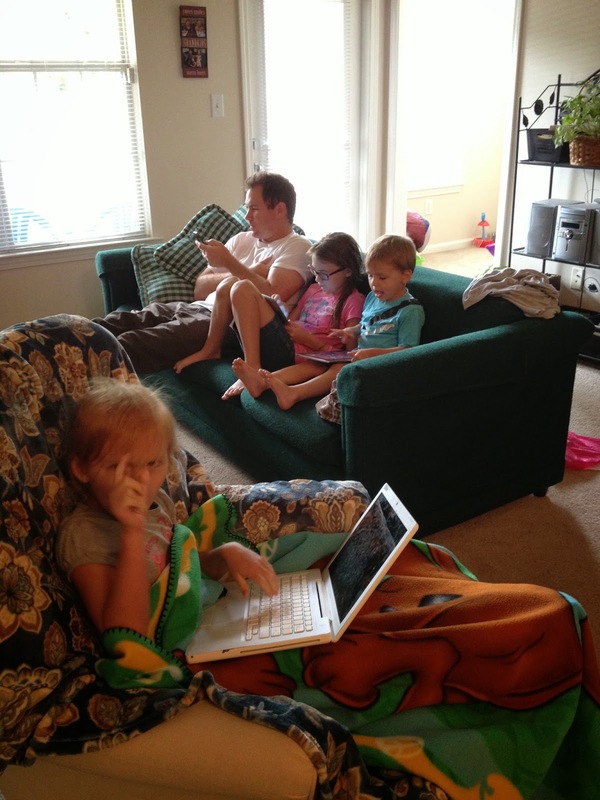 Devices and Tv do provide a welcomed rest and quiet. Check out this stay at home mom’s way to nap daily. We slipped into just existing, mediocrity. Even our Sabbaths (Be Refreshed) had been reduced to hours of Netflix or youtube toy reviews. I want to limit Facebook, totally life sucking/time sucking. I want to stop reading about other’s lives and adventures and live our own. LIFE IS MORE THAN SOCIAL MEDIA. One night at dinner I plan to tell them that I want more time with them, more fun and more adventure and that is why we are changing things up. Kids want us to have the fun with them not just provide the opportunities for fun. There will be resistance like right now I am being begged for my phone. There will be a new normal so gotta go implement it.